Six months ago, we launched Tribe of Heart's Online Screening Room as the first stage of our Global Tribal initiative, with a goal of making our films understandable and accessible to the majority of people on the planet. The Screening Room project not only enables people all over the world to have access to our films in their own languages, it also offers language-specific outreach and teaching tools, allowing for an instantaneous transition between the transformational experience of watching a Tribe of Heart film and taking action. We began by releasing our first film, The Witness, for free online viewing in English, Closed Captions, Spanish dubbed, and Spanish subtitled. Today we launch the Russian screening room. Learn more about this exciting new milestone and our future plans with the Online Screening Room by watching this slide show narrated by Tribe of Heart co-founder James LaVeck. Russia-based Voices for Animals Festival (Golosa Za Zhivotnikh) will be featuring screenings of The Witness this summer in St. Petersburg, Moscow, Novgorod and other cities. Dates and times TBA. 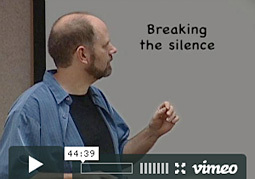 For many years now, Tribe of Heart co-founder and filmmaker James LaVeck has been giving talks on critical thinking, social justice, and the essential role of grassroots activism and independent media in maintaining a healthy democracy. At last year's Vegetarian Summerfest in Johnstown, PA, he gave an in-depth presentation geared toward longtime activists that highlighted the stages and cycles of moral development, while offering insight into how to work with the inevitable struggle with disillusionment that accompanies a commitment to align one's life with one's values. This talk is relevant to anyone working to create positive change in today's turbulent environment. James will be giving three more talks at this year's Vegetarian Summerfest, happening July 7-11. Details below. action to bring it to a stop. How the meat industry’s co-option of the animal advocacy movement continues to lead activists to violate their own values, and what we can do to reclaim our idealism and heal the disillusionment and despair caused by this unfortunate trend. Confronting the “locavore” idea of sustainable animal farming, Farmer Brown will explore the deeper ideas and agendas that drive these movements. When is it appropriate for animal activists with different methods of operation, and perhaps different underlying ideologies, to critically examine the work of other activists in a public forum? Does there come a point where divisions are too great, and the best thing to do is form a new movement? How do we decide if that time is upon us? This multi-media presentation will explore how Harriet Beecher Stowe --1850’s author of Uncle Tom’s Cabin -- along with the work of two visionary musicians and some remarkable experiences with individual animals inspired a new documentary about the ethics of the human-animal relationship. This inspirational talk will explore the power and the promise of our awakening conscience and will offer six peaceable practices we can follow to transform our relationship with the animals who share our world and help create a more just and compassionate future for us all. If you've never been to the Vegetarian Summerfest, this is the year to check it out! 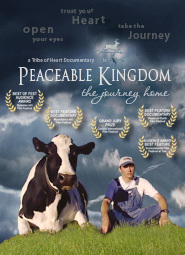 Tribe of Heart is a 501(c)(3) charitable organization that produces award-winning, life-changing films about the journey of awakening conscience and the ethics of the human-animal relationship. As a small organization with a big vision, we depend on the power of our community to make our programs come to life. Thank you for the many ways you help Tribe of Heart encourage positive, peaceful transformation.